The many women and men that serve our country in the armed forces deserve our utmost respect. They willingly sacrifice themselves in the pursuit of our country’s freedom. It is for this very reason that the Veteran’s Administration introduced Minnesota VA loans. 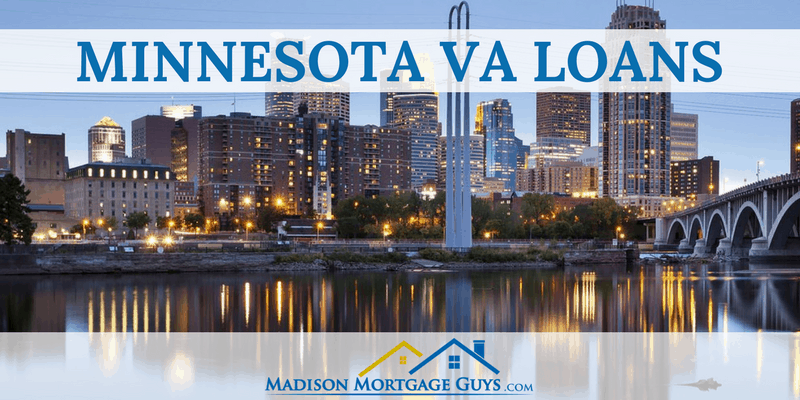 The Minnesota VA mortgage has a few distinct features that make it a great option for buying a home. Almost every type of mortgage will ask for some type of money to be paid upfront by the buyer in the form of a down payment. But not Minnesota VA loans. The guidelines for the VA loan expressly state that a qualifying veteran may borrow up to 100% of the home’s asking price, or appraised value, whichever is lower. Be aware of no down payment mistakes too, as any of these could derail your Minnesota VA purchase! All mortgages come with closing costs. It takes quite a bit of paperwork in order to document that a person or married couple has bought a home. In order to protect the veteran, the Veteran’s Administration puts a limit on the type of items that can be charged as well as the amount. Most loans that offer a low down payment also require an extra monthly fee called private mortgage insurance. This additional fee is paid to the lender. It acts as a safety net in case the loan is not fully repaid. The private mortgage insurance is typically calculated at a small percentage of the outstanding loan balance. The VA mortgage does not require any private mortgage insurance. Coupled with the no-down-payment option, it is clear how the VA loan can save borrowers lots of money. Like all mortgages, there are certain rules in place to determine who is eligible for the loan. Here are some of the basics of getting approved for Minnesota VA loans. If any of the above conditions are true, then you may use your DD-214 form and apply for the Certificate of Eligibility (COE). In order to obtain the VA mortgage, you will need to show how you earn income. This can be done in a number of ways. A multi-unit home. The maximum number of units is 4 and the borrower must live in one of the units. The VA mortgage does not approve loans for commercial properties or investment homes. If your credit score is not high enough to qualify for the top conventional mortgage rates, you may still qualify for a VA loan. The guidelines for VA look at the most recent 12 months history and are a bit more forgiving for past mistakes. There are also many ways to improve your credit score if you have time before you purchase. Minnesota VA loans have a dual clause to make sure qualifying veterans do not get a mortgage that is too expensive for them. First, there is the debt to income ratio. This ratio compares the borrower’s monthly income to their existing debt along with the proposed mortgage payment. If the ratio is 41% or lower, then they meet the debt to income ratio guideline. Secondly, there are residual income guidelines. This basically states that a person must have a certain amount of income left over after all bills are paid, to cover the necessities of their household. The amount is based on the number of people living in the home. Like most home loans, Minnesota VA loans come in many varieties. Picking the right one will depend on your specific needs at the time you choose to buy a home. The most common type of loan is the fixed interest rate. This means that the interest rate charged to the borrower will not change over the life of the loan. These loans are offered with several durations ranging from 10 years up to 30 years. This type of loan combines the features of the fixed rate mortgage with the one-year adjustable mortgage. The loan will have a defined period where the mortgage is fixed. Typically, this defined period will range between 3 years and 10 years. After the defined period has ended, the mortgage rate may change yearly, like the one year ARM mentioned above. Not only does the VA make it possible for qualifying veterans to get a home loan, they have a refinance option to allow homeowners a way to lower their rate without a lengthy mortgage process. The program is officially called an Interest Rate Reduction Refinance Loan but is often referred to as a VA IRRRL. These things are not always required since the goal of the loan is to provide a benefit to the borrower. A benefit can be defined as lowering the principal and interest payment on the new loan compared to the old principal and interest payment. Although it is usually declined, there are a couple of instances where it is possible for a qualifying veteran to have 2 VA approved loans at the same time which is also known as a Second-Tier VA mortgage. The most common scenario involves someone still enrolled in the military and has been assigned a new duty station. If the person has bought a home at their current location, they may choose to keep the existing home as a rental and use their COE to buy a second home at the new duty station location. However, the purchase price of the 2nd home may be lowered by the outstanding balance of the existing home. Your mortgage lender can walk you through the calculations to help determine how much you can borrow with your COE. The other way to have two VA mortgages at the same time involves foreclosure. There is a calculation performed when a veteran buys a home to determine their eligibility. If they have not used all of the entitlement, it is possible to buy a home with the VA mortgage after suffering through a foreclosure. Here is an example to help make sense of the calculation. Assuming that a veteran is considering a home in an area where the maximum allowed loan amount is $484,350 and that $43,000 of their entitlement was used in the foreclosure. $484,350 multiplied by 25% gives us $113,275, which is the maximum amount of guaranty. The veteran used $43,000 of the guaranty in the previous foreclosure, leaving $70,275. Multiplying $70,275 by 4 results in $281,100 maximum mortgage amount that the veteran may qualify for without a requirement for down payment. Any person that has previously served in the military or currently serving should always consider a VA mortgage as their first option for buying a home. The relaxed credit requirements and ability to buy with no down payment make it a great way to get a home and save money at the same time. VA Second-Tier Entitlement gives a qualified military person the ability to have two VA loans at the same time. Also known as VA bonus entitlement, the second-tier VA loan allows you to have two VA loans out at once in certain circumstances described in detail within. The months of April to July are usually the busiest for the real estate market. Data from past years shows that this short time span will contribute 40% of all home transactions for the year.